Oil prices are tumbling and could drop much more. If you own oil-related investments, be very careful. In early October, the West Texas Intermediate (WTI) crude oil traded as high as $77.00 a barrel. Now, it is trading around $51.00. In just a matter of a few weeks, oil prices dropped over 33%. Putting it in simple words, the oil market is in a bear market. Mind you, this has been one of the most rigorous sell-offs in oil prices in a while. Sadly, if you thought the decline was finished, think again. You see, there are basic fundamentals at play in the oil market. They are causing oil prices to drop so quickly. We have too much oil out there. There’s a supply glut. Initially, oil prices were soaring because traders and investors were concerned about the U.S. imposing sanctions on Iran. They feared this would cause a shortage in the oil market. The Trump administration gave some countries exemptions, and these countries happened to be a few of the biggest importers of Iranian oil. So, those shortage fears were instantly gone. Beyond this, oil production continues to soar. It’s important to watch U.S. oil production. In the past few years, the U.S. has become a major player in the oil market. Source: “U.S. 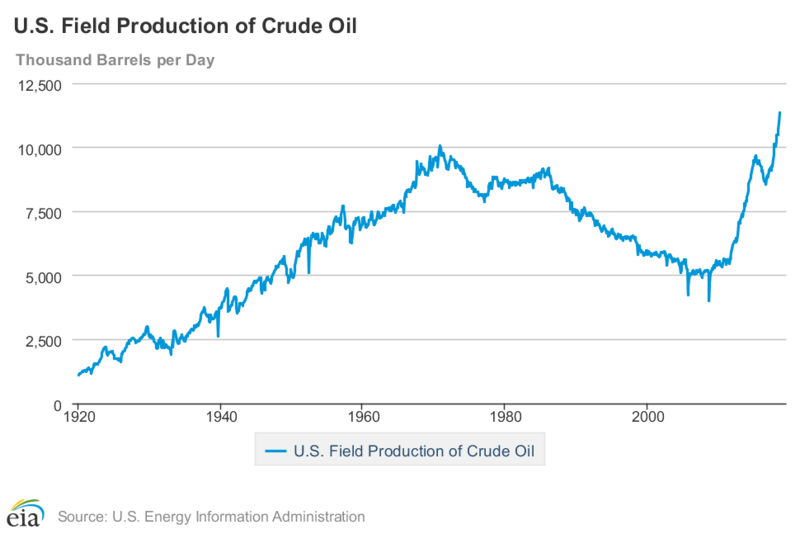 Field Production of Crude Oil,” U.S. Energy Information Administration, last accessed November 27, 2018. In August 2018, for example, U.S. oil production amounted to 11.34 million barrels of oil a day. A year earlier, it was 9.24 million. A decade ago, in 2008, this figure was just five million barrels a day. The U.S. is now one of the biggest oil producers in the world. It is now producing as much as—if not more than—Saudi Arabia and Russia. As the U.S. becomes a major oil producer, other major oil-producing countries are pumping more oil, too. Know that oil is a play on global economic growth. Currently, no matter where you look, the outlook is grim at the very best. Several indicators are suggesting that global growth could be in jeopardy and a slowdown could be looming. Major economies are reporting troubling economic data. If this is actually the case, oil will not be needed as much, and an increasing oil supply could be really bad for oil prices. When you have too much of something, its price declines. Oil follows this principle of economics as well.